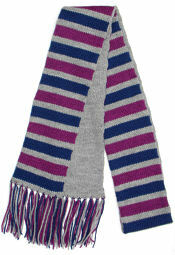 This handmade scarf is double-layered for warmth, and can be made according to your preferences. Stripes? Blocks of color? Variegated? 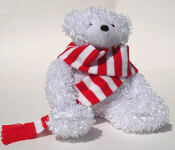 It’s very sporty done in team colors, and could also be personalized with a name or date. 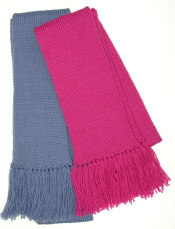 The ends can be fringed or plain. The winter scarf is hand-seamed so that it will never unravel. I usually use my favorite hard-wearing acrylic yarn for this item, but I am also happy to knit it in wool for even more warmth. A wide variety of colors are possible. This scarf is soft enough to wrap around your throat, but sturdy enough to tie in knots! Don’t hesitate to experiment. It can be wrapped around your head and ears, tucked into a coat, or tied around your neck as a fashion accent. Use it on your snowman! 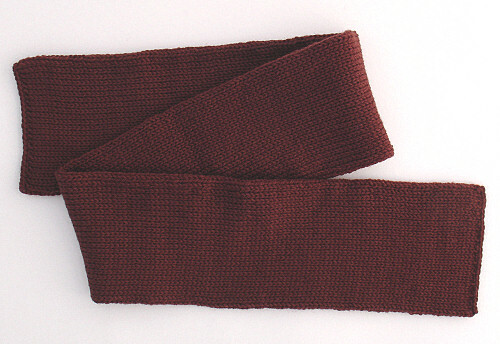 I am happy to customize this scarf to different widths or lengths. I can make it small enough for a favorite baby doll, or big enough for Paul Bunyan.